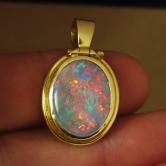 Size: Opal 20 x 15 mm. 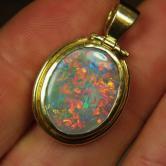 Note: This is a large and beautiful hand crafted 18 karat semi-black Opal pendant. More fiery and colorful in person than the photo's show. 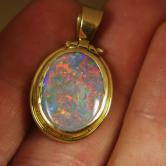 Quality and value in fine jewelry brought to you by Gem Line!